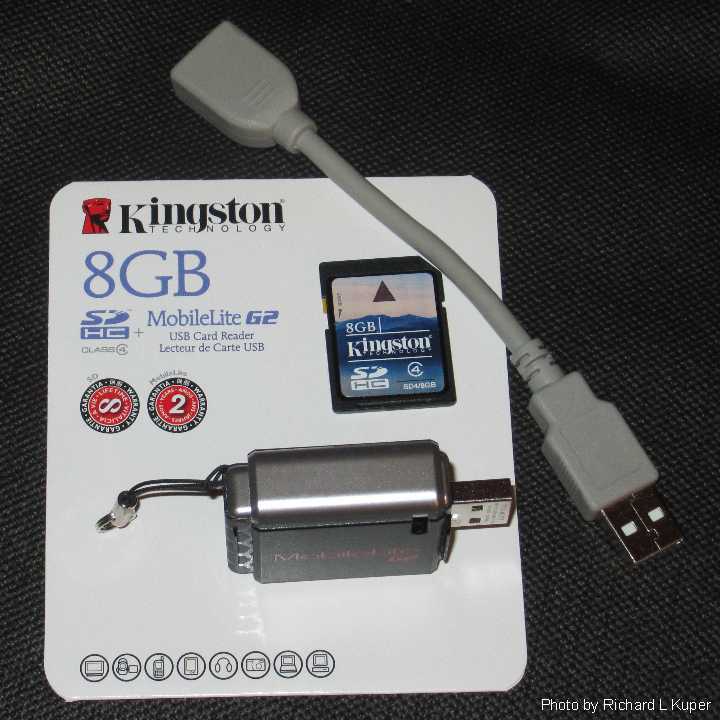 Kingston Digital, Inc. has released a new flash card reader, the MobileLite G2, which conveniently plugs right into any available USB port to transfer data between a variety of flash memory cards and either PCs or Macs. The MobileLiteG2 has retractable covers on each side to protect the USB connector and the Flash memory cards from damage. To use the MobileLiteG2, you just push in both sides, plug a compatible flash memory card in on one side, and plug the USB connector on the other side into the computer. The unit is a bit wide, so you may need to use the provided USB extension cable if there is not enough space for the unit. When I plugged the MobileLiteG2 into an available USB port on my PC it appeared as two drive letters. In my case, that was F:\ and G:\. The SD card slot turned out to be drive F:\ on my pc. I inserted a variety of SD cards and one microSD card (needed an adapter). All cards were recognized very quickly on my Windows XP system. Data transfer between the card and the computer is no different than transferring data between any two drives or storage devices. It couldn't be easier. Supported card formats include SD, SDHC, microSD, microSDHC, Memory Stick® PRO Duo™, Memory Stick® PRO-HG Duo™ and Memory Stick® Micro™ (*M2). The MobileLiteG2 is backed by a two-year warranty. Windows 7; Windows Vista® (SP1, SP2); Windows XP (SP1, SP2, SP3); Windows 2000 (SP4); Mac OS X v.10.3.x+; and Linux v.2.6.x+. The suggested retail price for the MobileLiteG2 Flash Card Reader alone is $11.00. For the reader plus either the 4GB SDHD card or the 8GB SDHD card, the suggested retail price is $28.50 and $46.00 respectively. This simple little device will make a great holiday gift for anyone with a computer that doesn't have a slot to read the various card types indicated above. And if you know someone who needs some simple, portable extra storage, or has or will be receiving a new digital camera, they will really appreciate the combination package with the 4GB SD HC card or the 8GB SD HC card.